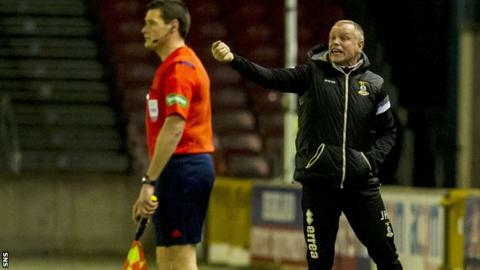 Inverness manager John Hughes insists St Mirren boss Tommy Craig will keep the Buddies in the top flight. Caley cruised to a 4-0 win over Craig's strugglers, who sit second bottom of the Premiership, in Tuesday night's Scottish Cup fourth round replay in the Highlands. But Hughes reckons St Mirren should stick with the 64-year-old. "If Tommy keeps all his players fit, he is the man to keep them in the SPL," he told BBC Scotland. St Mirren are level on eight points with bottom club Ross County but key players Steven Thompson, Isaac Osbourne, John McGinn and Jim Goodwin have recently returned to the fold. And Hughes, who did his coaching badges at Largs under Craig, believes having those players available again is crucial for the Paisley outfit. "I know the character of Tommy Craig, he inspires me and I've never worked with him," the Inverness manager added. "Every time I went down to Largs he was my coach, he was a great help with vast knowledge and some of the tips he gave me I use to this day. He loves to see the game played in the right way. "All managers go through a patch where their team are lacking confidence, but now he has Thommo, Osbourne and McGinn back. "I'm 100% convinced that with Tommy leading from the front, being as positive and enthusiastic as ever, that St Mirren will probably get themselves up that league." Tuesday night's win, after a 1-1 draw in Paisley, maintained Inverness' unbeaten home record this season and set up a fifth round meeting with Partick Thistle in the Cup. Gary Warren's header, a Greg Tansey penalty and second half goals from Danny Williams and Graeme Shinnie won it for the impressive Highland side. "It was a good team performance, we were clinical and I'm absolutely delighted," added Hughes. "I have to admit I was a bit apprehensive about the game tonight but all credit to the boys, we went about our business in a real good manner. They are a wonderful bunch to work with. I get everything out of them. "I see boys that are enjoying their football, they're playing with an education, we're passing it really well and we're confident. "The last time we went to Partick Thistle they beat us 3-1. They are a right good side."